Need to export Outlook MSG files to EML files? 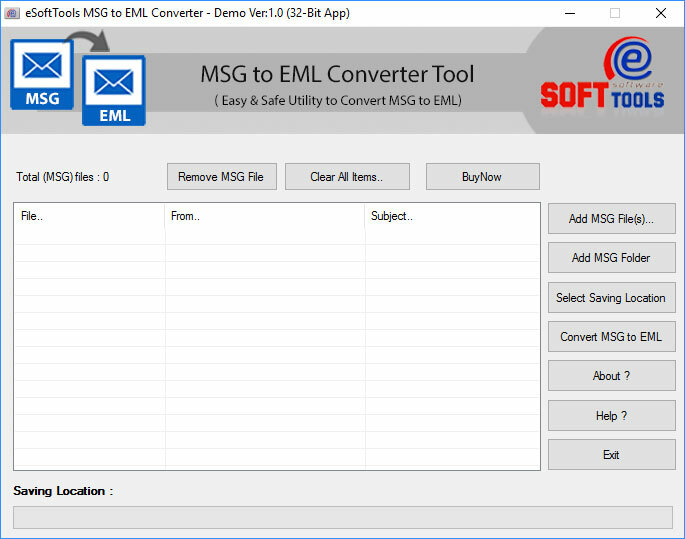 Now presenting MSG Converter to EML software which helps to export Outlook MSG files to EML file format with all information including To, Cc, Bcc, Subject, Date & Time and email attachments. Tested over 42,000+ MSG conversion at a time. Simplest procedure to export MSG to EML in batch. Never changed the structure of MSG email formatting. Convert both ANSI & UNICODE MSG files to EML file. Export MSG file to EML along with original attachments. Add unlimited MSG files for bulk conversion. Selective MSG conversion to EML available. One Software, Multiple Benefits - Export with MSG to EML file conversion tool and open converted EML in multiple emailing applications that support *.eml file extensions such as Outlook Express, Windows Mail, Windows Live Mail, Thunderbird etc. eSoftTools MSG to EML software has the ability to performs batch conversion of MSG to EML files without losing any data. Our MSG to EML tool perfectly opens every MSG files as RAW mode and export into EML files along with attachments. 1) Add MSG File - User can Add one-by-one MSG files from different-different location's. 2) Add EML Folder - User can Add MSG folder's having MSG items to load multiple MSg's at a time. User can remove MSG file from loaded list of MSG files, if you would not to be converted in EML file. For this you can click on the MSG file from listing and click on "Remove MSG File" button to remove MSG file. The MSG to EML Export tool allows you to easily switch MS Outlook MSG file to EML supported email client. Converted EML file easily openable with Live Mail, Outlook Express, Thunderbird, Windows Mail etc.. The MSG to EML file converter allows you to export multiple Outlook MSG files into EML file in batch mode. With "Add EML File:" button, you can select MSG file one-by-one and with "Add EML Folder:" button, you can select entire Folder having MSG files at once. Select files will load by the software instantly and ready for conversion. The software takes care of every part of MSG file during conversion into EML file. MSG to EML Conversion keeps original attachment file formatting embedded with converted EML file. During MSG Conversion to EML, software retains the complete Meta data structure. Software Preserves complete formatting of every email items, email attachments, hyperlinks, To, Cc, Bcc, and etc. eSoftTools MSG to MSG Converter support every version of MS Outlook and bitness (32-bit & 64-bit). Our software supports both ANSI and UNICODE PST files for conversion. User friendly interface with detailed instruction in each step of operation help users to get easy-to-use platform to export MSG to EML file. Demo Limitation - The Demo Version demonstrate you complete working process and facilitates to export 10 MSG into EML file. Select Individual MSG files from multiple locations. Add Bulk MSG files by selecting MSG folder. 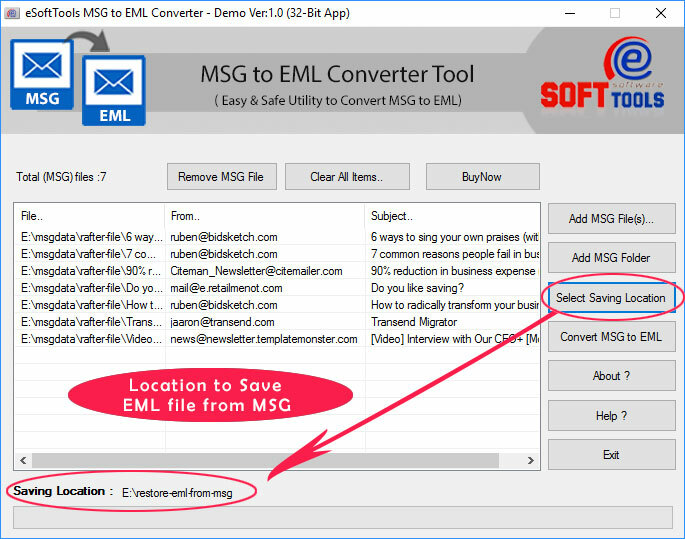 Screen to Save Location of Conversion from MSG to EML file. 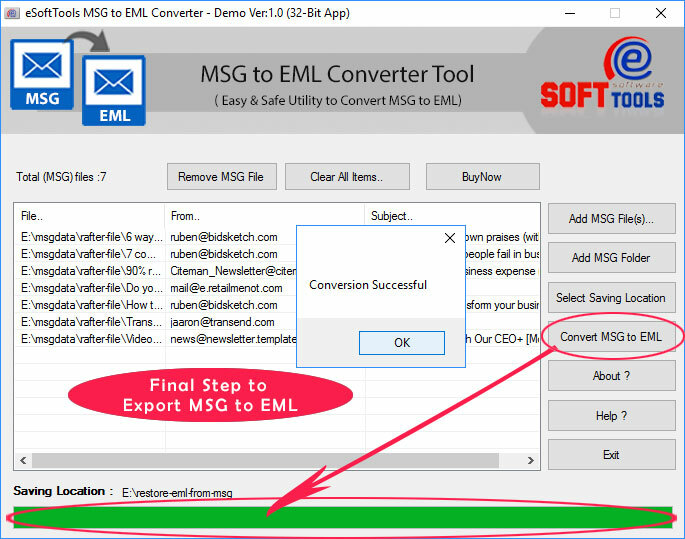 Final Conversion Procedure for MSG 2 EML Converter. I need to go with Windows Live Mail, but i have only MSG file which is not supported by Windows Live Mail. Is your tool for MSG to EML Can do. Yes.. You can easy to switch with Windows Live Mail. For this you must need to export MSG to EML and after that import EML files in Windows Live Mail store locaton. Is MSG to EML Conversion keeps the attachment file during conversion? 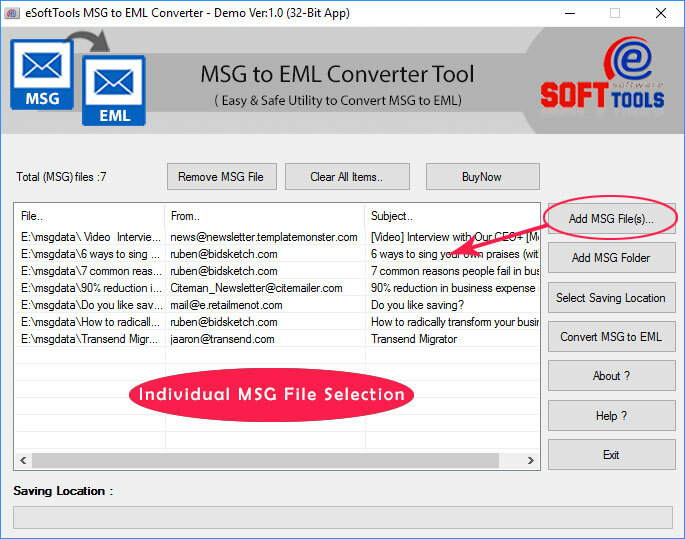 Yes, Our MSG Conversion to EML tool transfers MSG Attachments into EML file and keep them in original file. 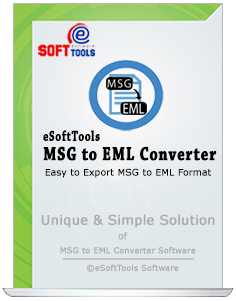 Demo version of eSoftTools MSG EML Converter Software, you can export 10 MSG Messages to EML format. Is your tool requires MS Outlook for conversion? Yes, Our software for MSG Conversion to EML, requires MS Outlook internal purpose and produce the successful MSG to EML conversion. Can I use this tool on MAC Computer? No, you can not install the software on MAC Computer. This MSG 2 EML Tool is pure Windows OS based software and can be installed on Windows 10, Win 8, Win 8.1, Win 7 and all below versions of Operating Systems. Great teamwork! Full Positive staff! It was this excellence in quality that helped me maintain my email migration much easier and preserve EML attachment… Thank you! Again.